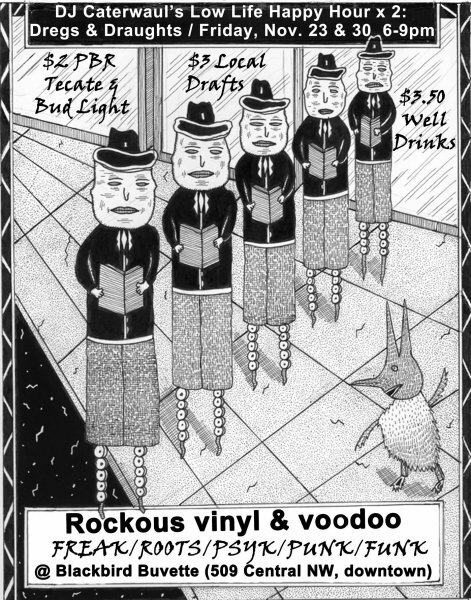 Outsider comic artist Mark Beyer originally created this art for a show at The Kosmos in August 2011. He was published in every issue of RAW Magazine during the publication’s 11-year run and contributed album and merch artwork for both John Zorn and Naked City. Gregg Araki loosely based his cult classic The Doom Generation on Beyer’s “Amy and Jordan” comic series. DJ Caterwaul recycles this art to hype a Friday night Low Life Happy Hour at Blackbird Buvette in this week’s Flyer on the Wall. See the award-winning drag veteran, writer, director and producer perform live. Bill Hearne's husky baritone finds its way into a song with the mellowness of fine bourbon and smooth pickin’ for a style he calls cross picking.